David Clapp is a founding partner of Alexandria RestaurantPartners (ARP), with a primary focus on operational strategy, finance, and growth. A native of Fort Mill, South Carolina, Clapp started in restaurants while in high school, and continued through college at theUniversity of Georgia, where he earned a BFCS degree in Hospitality Management1993. He promptly accepted a managerial position with Café Tu Tu Tango Restaurant Group, based in Miami, Florida, and worked his way through the ranks to become the VicePresident of Operations in 1996, helping to grow the brand to six restaurants with $20 million in annual sales. In 2003, Clapp left Café Tu Tu Tango to create and open Dantanna’s Surf, Turf & Turf, in Atlanta’s Buckhead neighborhood, and the concept quickly became known for its scratch cooking with high quality ingredients, and the vibrant settings that celebrate the passion and excitement of sports. 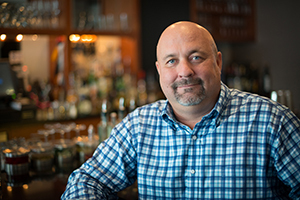 In 2006 he joined forces with long-time friend and colleague Dave Nicholas to create Bottom Line Hospitality (BLH), a restaurant management, operations, and development company, which owned or operated multiple restaurants in Florida, including Chispa, Bruschetta andShooter’s Waterfront. Eventually the two assembled a group acquire the Café Tu Tu Tango brand, which seemed fitting as it was where the partners met over 15 years prior to their 2009 purchase. In 2013, the owners of Virtue Feed & Grain in Alexandria,Virginia engaged BLH to turn around the fledgling concept, and in two years,BLH more than doubled Virtue’s sales while positioning it as the iconic OldTown dining destination that it is today. With that success, they rolled BLH into Alexandria Restaurant Partners (ARP) and began a focused expansion inAlexandria with concepts that include The Majestic, Lena’s Wood-fired Pizza & Tap, Palette 22, Vola’s Dockside Grill, The Hi-Tide Lounge, Theismann’s Restaurant & Bar, and the most recent ARP concept, Mia’s Italian Kitchen.